The second major European expedition to northern Japan, Hokkaido, and the Kuril Islands. Carte des decouvertes au nord du Japon. Faites en 1643 par les Vaisseaux Hollandais le Kastrikum et le Breskens, comprenant la Terre de Jeso, l'Ile des Etats et la Terre de la Compagnie, dont partie a ete reconnue en 1787 par les Fregates Francaises la Boussole et l'Astrolabe. An important 1787 map of northern Japan, Hokkaido, and the Kuril Islands by the French navigator Jean-Francois de Galaup, Comte de Laperouse. Oriented to the west, this map covers from the small islands due south of Yokohama Bay and northwards as far as Sakhalin and east to the Kuril Island of Iturup (Compagnies Landt). A large and dramatic view of Terre da la Compagnie (Iturup) decorates the lower left quadrant. Two small inset maps at top center are drawn from the works of Scheuchzer and Kampfer's History of Japan. 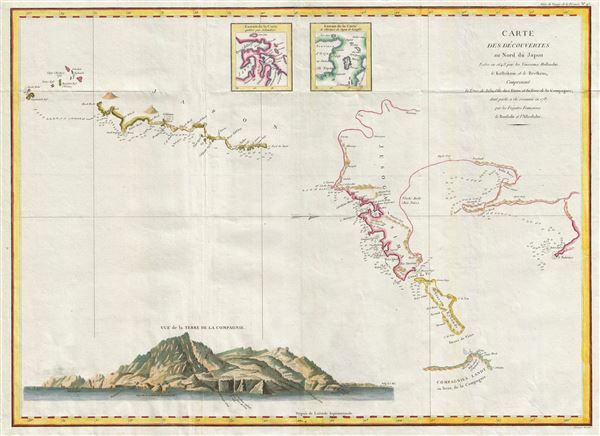 La Perouse, Jean-Francois de Galaup, comte de, Atlas du voyage de La Perouse, (Paris) 1797. Very good. Original fold lines exhibit minor wear.